After losing to Johns Hopkins five times, including a heartbreaking triple overtime loss a season ago, the Buckeyes finally achieved their first win over one of college lacrosse’s legendary programs by a 15-12 final score. Boy, did they ever earn it. The energy in The Shoe was intense, you could feel the emotion of the game from high atop the field in the press booth. It was the type of game that you didn’t want to end because it was so well played by both teams. So let’s breakdown the win over the Blue Jays and look ahead to Sunday’s game against Michigan. That Ohio State’s defense gave up 12 goals and they still won? That junior Ryan Brown for Hopkins had eight goals and an assist and the Buckeyes still won? That this was by far the best team performance of the year from the Scarlet and Gray. Despite falling down 2-0 early in the contest, it was far from over. Where there was a football/lacrosse field, I saw a tennis court. This game went back and forth as there were nine ties and three lead changes. And the offense came to play! How about that? 15 goals! Their ball movement was precise and smooth. Nick Myers and his staff have clearly made some adjustments since being shutout by Notre Dame. Their two man game was strong but their play from behind the net was even better especially with junior Carter Brown. He led the team with six goals, and most of them came from him swinging around the net from behind, beating his man or working off of a pick (they excel at picks from goal line extended by the way) and firing bullets off of quick turns from about five to seven yards out on the side. About senior captain Jesse King. Five goals and two assists on the evening. Just another day at the office for #19. Was awesome. He went 18-29 at the faceoff x. Drew Kennedy for the Blue Jays had more than enough struggle to deal with, going 4-16. May did what he needed to do. Simple as that. He made 14 saves, he seems to be getting better each week. His high to high reads were especially good from my perspective, and he finds ways to cut off the angles. I’ll say it time and time again. He’s the quarterback to a defense that will be the key for OSU’s success in the near future. The Buckeyes are building for an epic showdown at the shoe with No. 3 Maryland, but they need to take care of business against Michigan this weekend. There’s an expected 35,000 that will be at the Maryland game prior to Ohio State football’s spring game. Can it be April 18 yet? Ohio State and Michigan square off with major implications for the Buckeyes as they are building their resume for an at-large bid into the NCAA Tournament. OSU is 3-0 all time against the Wolverines with their last meeting ending in a 15-6 win for the Scarlet and Gray. Michigan always comes to play though as is the case in any rivalry game, so there’s no gimme with this one. OSU has the better team on paper and on the field. No question about that. They can’t afford to get caught up in emotions and take dumb penalties. Their offense needs to pick up right where they left off as well. Easier said than done, but this is, as it always is, a business trip. The Buckeyes have to set themselves up for the biggest came of the season against Maryland in front of over 35,000 fans. After missing the prior four games due to a lower-body injury, Michigan sharpshooter and top threat Ian King returned to action and scored four goals against Rutgers in the Maize and Blue’s 10-8 victory over the Scarlet Knights on Sunday. In six games played he has 16 goals and 10 assists. Despite missing four games, he still leads the team in both categories. 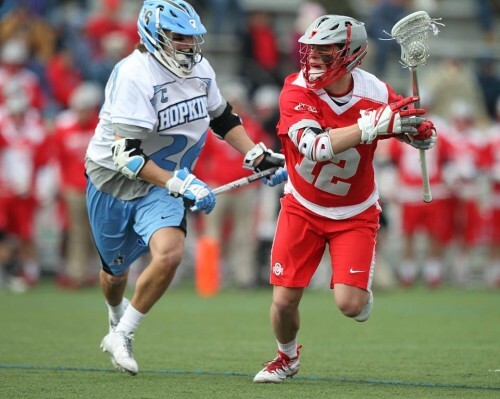 Meanwhile, Ohio State’s King (Jesse) is cruising along following a five goal, two assist performance against Hopkins. He now has 29 goals and 17 assists, leading the team in both those categories as well. Michigan scored eight goals against No. 1 Notre Dame, compared to OSU’s zero against the Irish, but they were still beaten by nine with a 17-8 final score. Michigan beat Detroit who OSU lost to 9-8 to start the 2015 campaign. Michigan beat Bellarmine 16-9 who OSU barely edged out 8-7 albeit the Buckeyes started strong and didn’t finish well that game. So if that tells you anything, it says Michigan is not a team to be messed around with. The broken record continues for this portion of my column. It will be no cakewalk on Sunday in Ann Arbor. Ohio State is a deeper team and are much better defensively. Michigan is sitting at 45.6 percent on faceoff wins, which essentially means that Christopher May is eyeing this contest as a lion hunts a wildebeest. The offense needs to play strong to their systems, excel at the two man game and continue to work well off the picks. If they do that, they should be fine. That’ll do it for this week. Catch you next Wednesday!